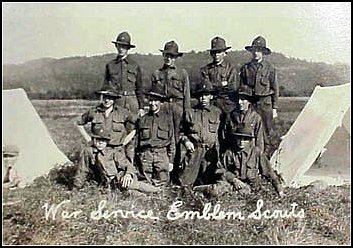 Scouting's full resources were placed at the service of the United States Government in World War I under the slogan "Help Win the War." 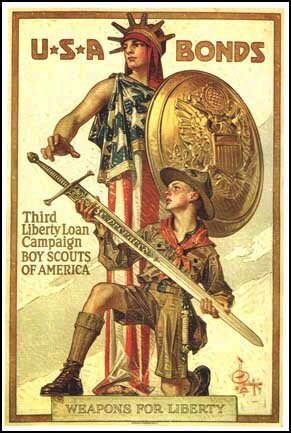 As part of the war effort, 1917-18, Scouts sold 2,350,977 Liberty Loan bonds, totaling $147,876,902; war savings stamps, to a value of $53,043,698. The U.S. Treasury recognized the achievements of outstanding Liberty Loan sales by Boy Scouts and Girl Scouts. Here are several Liberty Loan items from Scout Wesley Johnson, Troop 14, Planville, Conn. 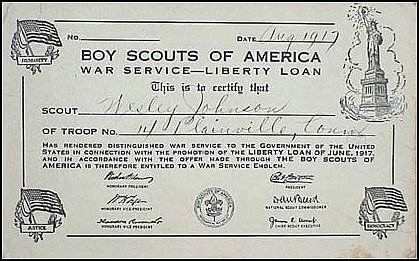 Please see the article USA's Boy Scouts and World War I Liberty Loan Bonds by T.P. McDermott from the May/June 2000 SOSSI Journal. 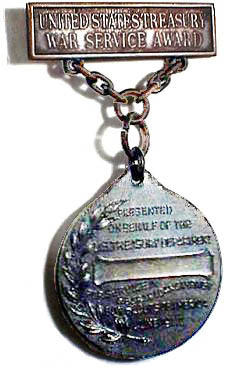 The Boy Scouts and Girl Scouts were also very active during World War II. Scouts begin campaign selling Defense Bonds and Stamps in 1941. Liberty stamps cost $0.10 each which was the cost of a comic book. Many children would bring a dime in each week to buy a stamp to put into their book saving for a liberty bond. A liberty bond could be purchased for $18.87. It would mature to $25 in 10 years. Harry James Westerman Liberty Bond poster Boys, Do Your Duty : You Can Help Big Brother by Buying Thrift Stamps : Fill Your Card.